Plans Announced For May Day Actions In Western Mass. 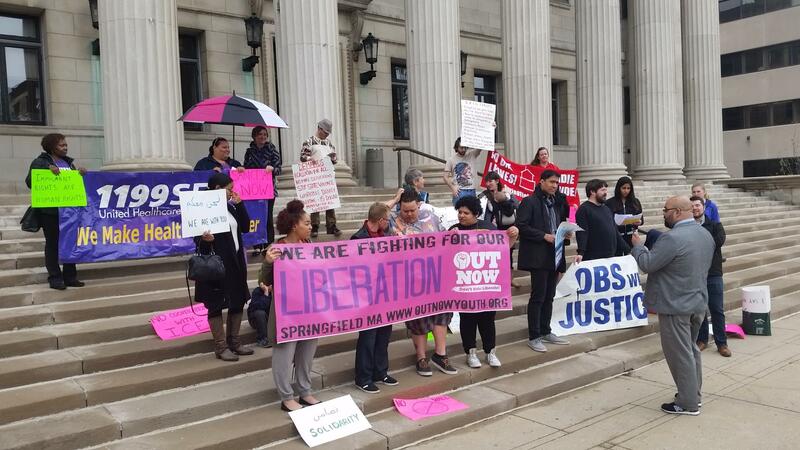 People representing several organizations gather on the steps of Springfield City Hall to announce plans for May Day protests, marches and rallies in Northampton and Springfield. Activists called today for workers to strike and businesses to shut down in western Massachusetts on May 1st, as part of what is expected to be a nationwide protest. A coalition of more than two dozen groups, social justice organizations, labor unions, and small business owners is behind the effort locally to convince workers to stay home from their jobs, students to skip school, businesses to shut their doors and consumers to close their wallets on May 1st in support of causes including a $15 minimum hourly wage and protections for undocumented immigrants. Representatives from several of the local sponsors held a news conference Wednesday on the steps of Springfield City Hall.
" The May 1st strike is just one tactic of a larger movement to win racial and economic justice," said Diana Sierra of the Northampton-based Pioneer Valley Workers Center. She anounced marches and rallies are planned on May 1st in Northampton and Springfield. May 1st, or May Day as it is sometimes called, has been observed for decades by the international labor movement and is a holiday in some countries. Rallies and marches are held to promote workers’ rights. Sierra said this May Day will include calls for solidarity with immigrants.
" I do think the Trump election has opened the eyes of many people who under a Democratic leader were accepting of ( immigration policies) but now that the rhetoric is getting more racist and xenophobic people are taking pause to try to stop this," said Sierra. The march in Springfield will begin at the old federal building on Main Street and end at City Hall where participants will call on the City Council, which is scheduled to meet that night, to endorse a sanctuary city resolution. Mayor Domenic Sarno has adamantly rejected the sanctuary designation for Springfield. City Councilor Adam Gomez said he’s working to write a resolution that all 12 of his fellow city councilors will support, but it will likely stop short of calling on Sarno to change his position. "This should not be a political stance that creates some sort of battle between us and the executive branch," said Gomez. The May 1st actions will also promote the campaign in Massachusetts to raise the minimum wage to $15 per hour, according to Eric Bauer, an organizer with Massachusetts Jobs with Justice. "$15 minimum wage is the win we think we can make now and we will keep fighting for a $17 minimum like they have in Seattle and then Massachusetts will go even higher than that," said Bauer. During the march in Northampton on May 1st, organizers say they will point out businesses where workers have alleged wage theft and harassment. Government officials are reacting to the latest federal threats to "claw back" funding earmarked for sanctuary cities. University at Albany students staged a May Day rally Wednesday to protest several issues, including the installation of Sodexho as the campuswide food service provider. The Trump administration is trying to turn up the pressure on so-called sanctuary cities, but so far activists in western Massachusetts are not backing down in their efforts to shield undocumented immigrants from deportation. As protests erupted over the weekend against President Trump’s immigration and refugee bans, communities in Massachusetts are responding to the president’s proposed crackdown on sanctuary cities. Trump signed an executive order threatening to strip federal funds from communities that harbor undocumented immigrants. The Massachusetts legislature is expected to take an initial step tomorrow in enacting a so-called “millionaires’ tax.” Advocates on both sides are stepping up their lobbying.